I possess an intellectual spirituality that makes me shy away from an outward display of faith-filled emotions. I prefer internal intensity. I also fear how such emotions are temporary. Ephemeral feelings should not be the foundation of the spiritual life. Although, we certainly benefit from the good times, those windswept moments of conversion embody our senses with great expectation that what lies ahead is full of limitless potential through Jesus Christ. We think, “I can overcome my struggle with sin!” or “My past is simply that, my past. Christ is my present and future.” Every Spirit-filled beat of our hearts points us toward God. We stand in awe of God’s unquenchable love and desire for us, and weep at his readiness to forgive us and help us to grow in Him and through Him. Yet, like the thrill of a beautiful woman throwing you a wink, the moment fades away. As often we try to keep growing, we fall. Adoration, Confession, Mass, Scripture reading, prayer, all give us strength and direction, but we still commit the old sins of our supposed ‘old-self’. The hope that bubbled up in our good feelings is gone. I used to rely on my intellect to get me through the dark days of sin, instead of good feelings. Whether I read a saint’s writing, had a theological discussion with friends on the difficulty of living the Christian life but the reality of God’s grace to live said life, etc, I used my intellect to rationalize my way around or from sin rather than seeking Christ’s help. Wrapping myself in knowledge, but not love or trust in God became a problem. Rather than letting the knowledge I gained guide me into a deeper relationship with Jesus Christ, I set myself up for falls by making my own mind the master instead of God. I saw God in what I read and learned, but I didn’t see God. In recent months, I’ve tried to change how I use my intellectual spirituality so that I can grow closer to God. You see, knowing something is wrong, understanding why, and trying to internalize that thought will only get you so far if you are not trying to actively cultivate a spiritual life centered in a relationship with Christ. Similarly, it is the difference between knowing who Christ is and knowing Christ. This brings me to a question I have contemplated for the past month. You may have noticed these questions in a previous article of mine. Can we, as Catholics, claim to have faith in God, but carry no hope within us? Or, can we say we trust the guidance of the Holy Spirit without hope? A Biblical example might help illustrate what I mean. Take Mt 22: 23-33 (also Mk 12:18-27, Lk 20:27-40) where the Sadducees question Jesus about the afterlife and the Resurrection. As Sadducees, they only accepted the Pentateuch as canonical. Thus, since no afterlife or spirits are mentioned, they did not believe in the afterlife or resurrection and thought they held ridiculous problems at odds with Scriptural teaching. Despite this lack belief in an afterlife, the Sadducees continued to advocate Temple worship, Scripture, honoring God, purification, etc. Granted, they temporally benefited in power, prestige, and riches, but there were still some Sadduccees who wished to give glory to God without the promise of Heaven. There is something admirable in that perspective. But, such thinking is much like washing the outside of the cup without worrying about the inside. However, I do not refer only to our hope in the Resurrection or Heaven. Resurrection and Heaven are the hope. I am also referring to hope as it is lived this side of the veil, as hope is lived by individuals in their daily lives. Hope that God is with us, guiding us, sustaining us in our trials, reminding of us of our individual calls and, ultimately, callings us to heaven. The difference between the two is important. Heaven-hope gives us solace that perseverance will end in the everlasting hills with Christ. But, this solace only truly takes root within us if we carry the daily-hope. By daily-hope I mean having faith and hope enough that God desires our good and is forming our hearts for Him each day. That our sins and sufferings may cause us to bear tremendous spiritual and emotional suffering, but Christ will always bring us back to Himself. Without daily-hope our Heaven-hope can turn sour. We may enter into a circular ‘going through the motions’ phase rather than continuing the journey with Christ. How do we hope when hope seems lost? How do we keep hope alive within us despite seemingly unending disappointment and regret over our sins? We are supposed to hope that somehow, some day, we will finally be saints. How? In a word, trust. Trust is paramount in the Christian life, but trust is overshadowed or forgotten at times, partially because it is implicit rather than explicit, by other virtues. Faith, hope, and love all imply total trust in God. Love is the total self-giving for the good of the beloved without a thought of return. Hedging your bets with God is not trusting Him. Loving Him totally is to be totally exposed and trusting His love for you will remain undimmed in the face of your sins. Even mortal sin cannot remove God’s love and desire for you. Hope is accepting God’s grace to hope and trusting in Him, because you understand you can neither sanctify yourself nor attain salvation on your own. Your hope is in the life to come. Faith is trusting in the things unseen, but promised by God, even as the world attempts to disturb your faith. Enduring trust in God is one of the secrets of the saints. They did not suddenly reach the summit and say to themselves, “Well, that was tough! I am sure glad the struggles are over with now that I’m a saint.” Our dry, holy card image of the saints can sometimes white-wash the reality of their inner struggles and tough choices to keep following Christ to Calvary right up to the end. Because that is what we must do. The Jews complained that the Eucharist was a ‘hard truth.’ This, total abandonment to Christ, is a hard truth for me. Why can’t Christ work with me? Well, He does, through free will. We are given the choice: His will for our good and salvation or our choice for sinfulness. God forces nothing. I can chose to either love God and trust Him or try to do it apart from Him and on my own. But, in the end, my own selfish path would fashion a heart of stone and not of flesh. Faith answers my question. No, we cannot claim to have faith, yet live without hope. To have faith is to hope in the promise of Heaven and trust in God’s love. The two gifts are as inseparable as the Cross and God’s love. The Cross, the epitome of God’s love, is a paradox because it is a thing that would seemingly destroy all hope, but in reality gives inexhaustible hope. That which should defeat gives ultimate victory. 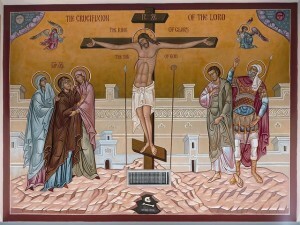 The Cross is where we should look for hope; Christ’s Passion. Christ’s love, sacrifice, falling and rising, helps us by giving us an example to inspire us in our own journey (1 Pet 2: 19-21). Our suffering unites us to the Cross. 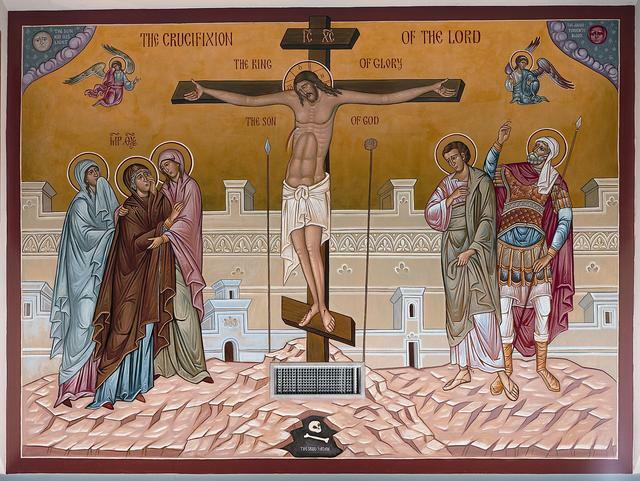 Those who have hope in the midst of suffering remember what follows the Crucifixion. No one wants to suffer. But, do we accept our sufferings as Christ did out of love for God and others? Do we doubt the moment the ship enters rough seas? Or, do we have the faith and courage, like St. Peter, to set foot upon the raging water? Will we trust that Christ is there to grab hold when we falter? I enjoy reading the lives of the saints, Lord of the Rings, the Chronicles of Narnia, superhero stories, and other tales of heroes fighting for others in dark times. They help me to remember what we are capable of achieving when we live for others. In an odd child-like way, they also give me courage and hope. I have to believe that I am capable of living the way Christ calls me to live for others, for their sanctification as much as my own. Faith is the substance of hope…It is never too late to touch the heart of another, nor is it ever in vain. In this way we further clarify an important element of the Christian concept of hope. Our hope is always essentially also hope for others; only thus is it truly hope for me too. As Christians we should never limit ourselves to asking: how can I save myself? We should also ask: what can I do in order that others may be saved and that for them too the star of hope may rise? Then I will have done my utmost for my own personal salvation as well. Thus, to hope is to love others as Christ has loved us (Jn 15: 12-17). “Man is redeemed by love…When someone has the experience of a great love in his life, this is a moment of “redemption” which gives a new meaning to his life.” This love is redemptive when it is God’s unconditional love for us, always certain and eternal (Rom 8: 38-39), and passed on to others. Perseverance in hope, despite the world telling us that hope is more or less gone and we should just make the best of it, is to be a Christian. When we look away from the Cross, suffering becomes even more difficult because our hope is in the temporal rather than the eternal. “Apart from me you can do nothing” (Jn 15:5). Christ didn’t say we might achieve some things apart from Him. Nothing can be achieved without Him. That includes hope. Our hope has to come from outside ourselves, which means receiving hope from another: Christ. As long as we hope in Christ and His promises to be with us always, (Mt 28:20) we cannot be disappointed. So, keep hoping in Him and His love for us through the trials and tribulations, because in hope we are saved (Rom 8:24). In closing, while it is particularly un-Texan of me to use another state’s motto, South Carolina’s motto is a quite fitting way to end. Dum spiro spero. While I breathe, I hope.